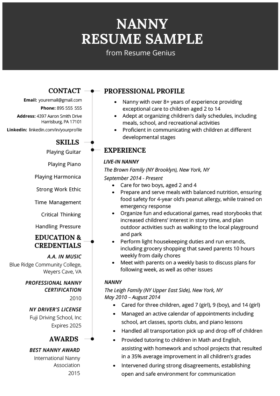 A great hotel housekeeper is tidy and organized, and their resume should reflect that. 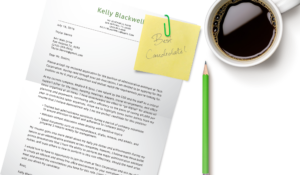 Use our industry-specific resume sample to help assemble your own, and check out our 3 expert writing tips to make yours even better. To build a good housekeeping resume, you will need to emphasize your efficiency, cleanliness, ability to listen to instructions, and customer service skills. 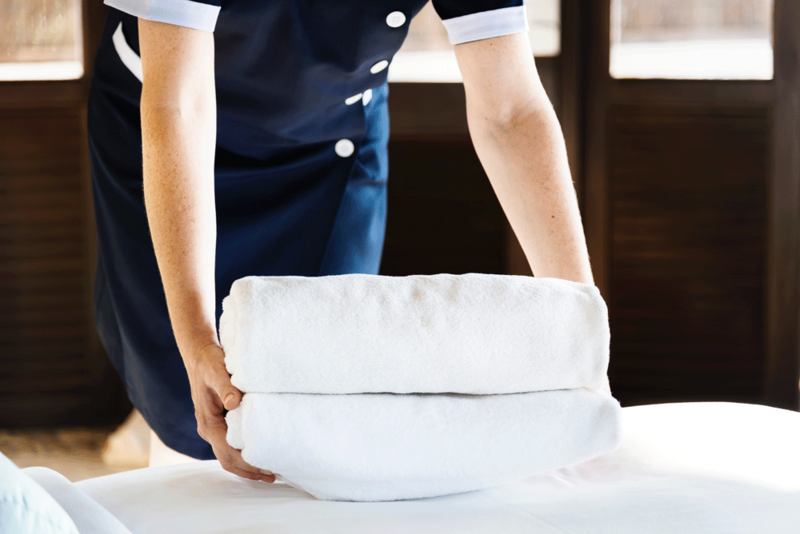 If you have previous housekeeping experience, getting a new job should be straightforward. If you do not have previous housekeeping experience, you’ll need to use examples from your other professional experiences or personal life to prove that you’ll be a valuable worker. Your experience level will affect your pay. Take note, student resume writers — you will almost always use a reverse chronological resume format. You’ll need to learn how to write one if you want to build a good resume. If you’ve recently been in college or university, your Education section should come before your Professional Experience section. Andrea, the applicant, has an associate’s degree in Hotel Management. 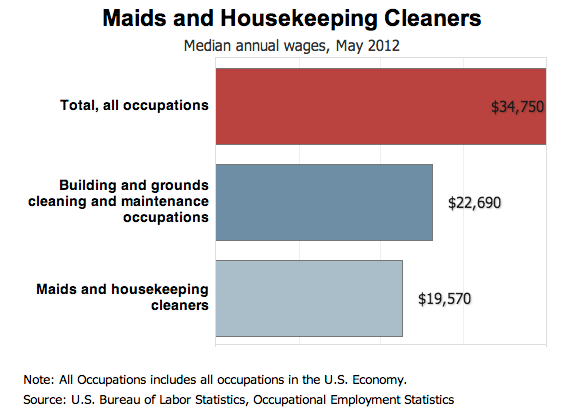 Associate’s degrees are great but not necessary to become a professional housekeeper. Many learn through on-the-job training and apprenticeships. REH (Registered Executive Housekeeper) – Perfect for entry-level applicants because it can be attained by testing or by submitting proof of 30+ hours of continued education credit. CEH (Certified Executive Housekeeper) – Similar to REHs, the CEH certification is for those who fulfill requirements through self-study or college courses equal to or greater than an associate’s degree. *Regular bachelor’s degrees in tourism, travel, hospitality, and management are all impressive additions to a professional housekeeper’s resume. The Education section of an entry-level resume is generally the most important section — read our in-depth guide here to ensure that you have the highest chances of landing an interview. An impactful Professional Experience section includes numerical values and lays out the applicant’s diversity of skills and services. Always emphasize a high level of professionalism, focusing on efficiency, safety, and cleanliness. Including keywords such as “safety,” “efficiency,” “thorough,” and “organized” throughout a housekeeping resume helps it stand out. Always emphasize a high level of professionalism, focusing on efficiency, safety, and cleanliness. If you do not have professional experience within the industry, pull examples from your other experiences that are transferable into the industry. For instance, if you’ve worked as a waiter, it’s likely that you have cleaned the restaurant at the end of your shift. Another strategy is to get recommendations from other people about your skills and dependability. When composing your housekeeping resume, make sure that the Professional Experience and Additional Skills sections are optimized. Don’t worry about the resume appearing brief — as long as it takes up the majority of a page, it’s OK. 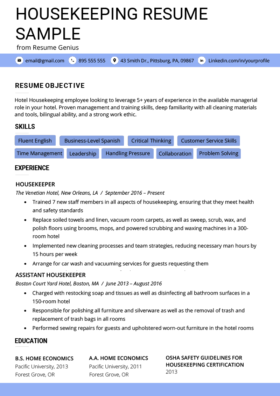 The housekeeping industry doesn’t require as detailed or lengthy a resume as an executive-level resume, for example, so keeping it to one page is perfectly acceptable. Writing a strong resume is just one part in the process of job seeking. Make sure you’re familiar with all the job search skills and strategies out there.